The socio-cultural branding of the American Girl range of dolls. ﻿Subject: The sociocultural branding of the American Girl Date: 3/10/2011 ________________ General knowledge about the American Girl As an iconic brand, American Girl is an American line of dolls that portray ten-year-old girls of a variety of ethnicities living in various times throughout American history. The dolls are always sold with accompanying books told from the viewpoint of the teenage girls. Products include books, dolls, and doll clothing and accessories, as well as immersive retail and catalog environments. The flagship and first store debuted in Chicago followed by stores in New York and Los Angeles. The brand image of American Girl in the different consumers? 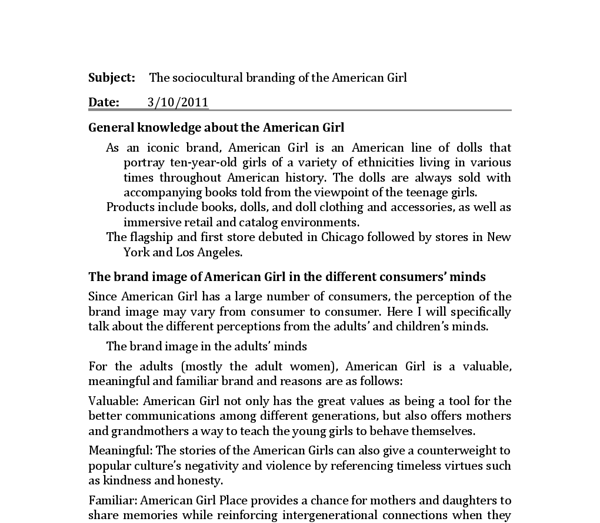 minds Since American Girl has a large number of consumers, the perception of the brand image may vary from consumer to consumer. ...read more. The brand image in the children?s minds For the most children, American Girl is a dolls? brand which is very interesting, but few older children may also treat it as a brand that can arose resonance, here are the reasons: Firstly, the books, dolls, clothing and accoutrements can provide the girls a stage to show their imagination and creativity. Secondly, Most of the little girls can only reenact stories from the books literally and make up stories that have nothing to do with the characters in the book, or just enjoy the manipulation of the dolls and their clothing, accessories and accoutrements. Thirdly, some of the older girls can use the stories to illuminate their own lives and facilitate the performance of life tasks, then have a better understanding of their real life. ...read more. 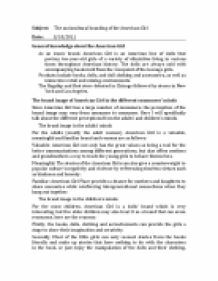 From the socio-cultural influences of the American Girl The culture of the American Girl acts as a perceptual frame through the characteristics and stories of different American girls. Every American girl has its cultural value and the special history background which related to the important events in the American history. This special culture background will not only remind the adults of the specific history but also help them to form a better point of view towards the history events. Besides, American Girl may also influence the children when they are acting as a certain American girl. In this way, the children can fit themselves into the characters and then try to know more about the culture backgrounds of that time. Thus, they will have a better understanding of the culture and history of that time. ...read more.